I’ve been redesigning the sidebar (The area to the right) to serve a better purpose. I’ve added more content such as webcams and I have also added a new area to display my favorite “Road Photos”. I got rid of some plugins that were just duplicates and really weren’t needed after all. I hope to continue to add content to the sidebar that is both interesting and useful. One such item will be a blogroll. This will add links to other websites that are like mine from different individuals who travel and ride. 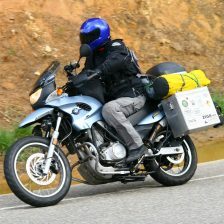 I also plan to add more “Road Photos”, header photos and webcams soon.